Day 2: Over and Done | how 'bout some cake? ← Day 1: Great Success! Day two of our journey was mostly uneventful. We woke up and hit the gym to get a little exercise before our nine hours in the car. By the time we were showered, packed, and back in the car, it was about 12:15. We drove. And drove. And drove. Road trips are much more fun from the passenger seat. Unfortunately, this is one of the many things Jason and I agree on. It was 9:30 or 10:00 by the time we got to San Antonio. Again we booked our hotel on the road through Priceline, and this time we got a deal on a beautiful old hotel called the Emily Morgan. The best thing about the hotel is its location. We look down at The Alamo from our hotel room window, and it’s just a couple blocks from the Riverwalk. As soon as we dropped our bags off at the hotel, we headed down to the Riverwalk. We were glad to find that many of the restaurants were still open and serving. 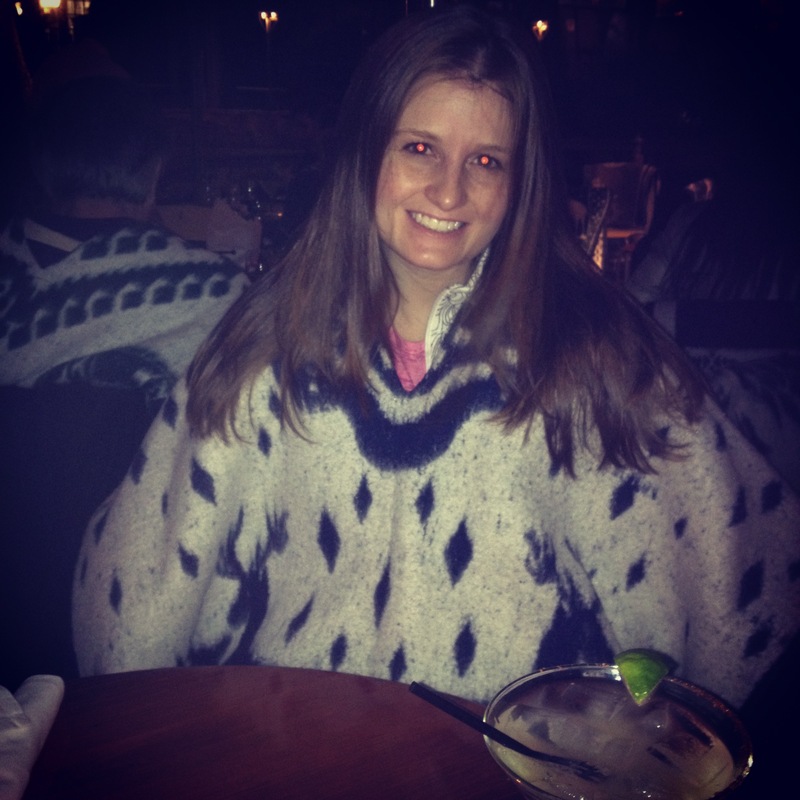 We were immediately drawn to Texas Bistro because they offered awesome wool ponchos to all their patio guests. So we sat outside along the river (me, directly underneath a propane heater) all snug in our ponchos, and enjoyed another great meal. I guess this road trip has sparked Jason’s sense of adventure. He ordered the duck gumbo and quail for dinner. 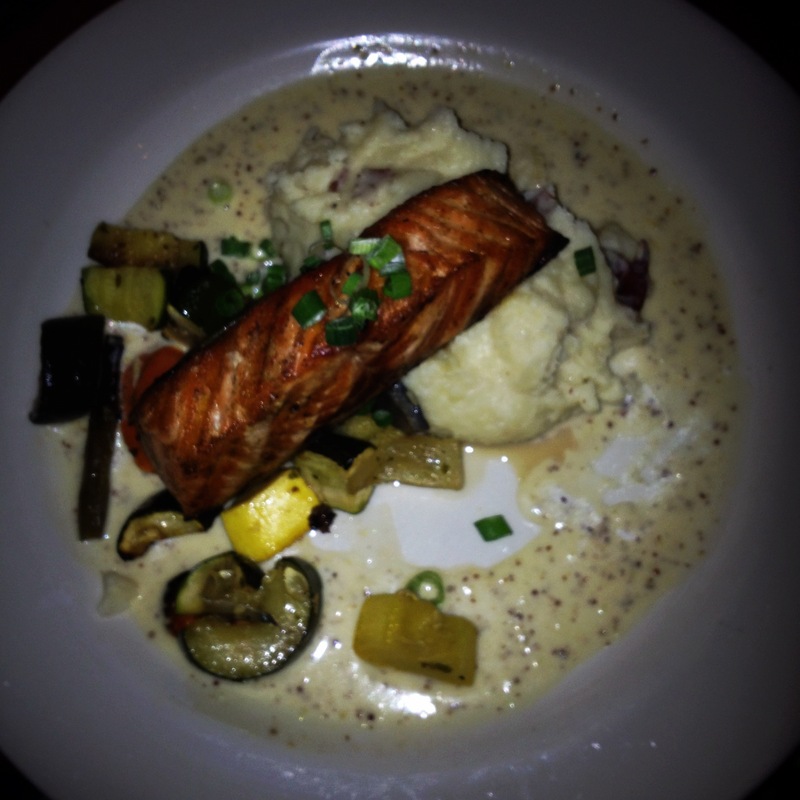 I had the salmon with mashed potatoes and roasted veggies. It really hit the spot. Maybe I ate too many of the mashed potatoes. Maybe. Once again, I thought to myself “I wish we had more time here”, but at least we got to enjoy it a little bit after our long day in the car. 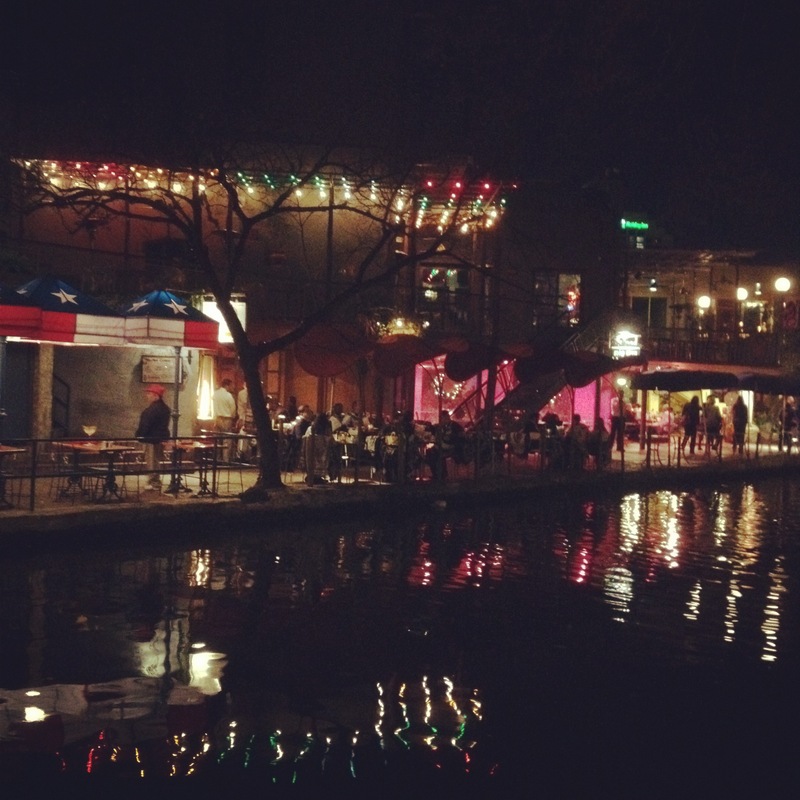 After dinner, we walked along the Riverwalk for a few minutes before returning to our hotel. It was getting close to midnight, and we had another big day ahead of us. Crawling into bed had rarely felt so sweet.